All I want is to turn the dock into a menu in the menu bar and to put the Trash on the desktop. Any ideas? Try Application Switcher Menu (ASM) 2.1.7, which brings the application switcher menu (and more) to Mac OS X. It's highly customizable and offers some nice extra features, such as Classic Window Mode (orders all windows of an application to front when it becomes active) or Single Application Mode (automatically hides applications other than the front-most one). $15 shareware. For Trash on the desktop, try Trash X. It functions just like the classic Mac OS Trash - files and folders dropped on it are moved to the Trash, and disks dropped on it are ejected. In addition, it also features numerous functions for the power user. You can use it to instantly delete or shred file and folders without sending them to the Trash. You can use it to empty or shred Trash only on selected disks. And, of course, you can use it just like the trash can you've always had on your desktop. Trash X is completely safe and requires no system hacks or Terminal command line voodoo. Place an alias or copy of it on your desktop, in your documents folder, or anywhere else you wish. I daily check out Applelinks and Low End Mac, and I find your articles in both places interesting and informative. Two other nice features for OS X are XAssist, which brings back the Classic OS 9 (and below) application menu on the right side of the menu bar. Two ways to get your trash can back on the desktop are Bin-it (it costs $9.99) and iCan (shareware). I have used iCan but not Bin It. Good to know that these programs are there! Thanks for the tips, George, and for reading! I'd heard of Bin-it, but the others are new to me. Hey. I liked your article on Restoring Mac OS 9 features to X. Being a diehard Mac vet since System 7.6, that article delighted me. Anyway, just one thing about the article that I noticed in the first paragraph. You said that you are very happy with Mac OS X since Panther, and in parentheses you said the version number (10.2), just pointing out to you that I think you meant to put 10.3 there. Definite typo, but not mine. I just checked my original draft of the article, and I definitely said OS 10.3, so Dan must have boo-booed when he edited the column for posting (hi Dan ;-) ) I'll bring it to his attention. Adam is still with us; his most recent column was posted June 30. You can find the archive of his articles here. I have read your article regarding Mac OS X 10.4 updates and modem incompatibility issues. I have the same problem, but I have the new MacBook and the new Apple USB external modem. Did you come up with the solution? Have you found a link that discusses this issue without having to spend two days on the Net? Can you forward me some of the tips? I know, too many questions. To tell you the truth, right now I am contemplating sending Apple the bill for the time I had to spend on the computer trying to fix the problem, install, and uninstall! So I am hoping that you have a clean and easy solution. I hope that Apple will come to its senses and acknowledge that an awful lot of us are still either completely dependent on modem support for Internet access - or at least require it from time to time when we're on the road or need to send/receive a fax from our computers. The modem is many years from being dead technology, but my impression is that Apple has been less than assiduous about ensuring solid modem support in recent OS versions. That said, in my case the charm proved to be running the OS X 10.4.6 Combo updater rather than the incremental "Delta" version. Doing that cleared the issue on my PowerBook. I just updated to OS X 10.4.7 (also using the Combo updater), and the modem is working great. Perhaps worth a shot, especially if you have been letting your system automatically update via the Software Update feature. I just thought I'd inform you there is a serious pitfall for the target disk mode installs. When in Target Disk Mode, the Mac appears to be the source machine's model to the installer, and not the target machine, as the target machine might as well be an external hard drive on the source machine. I don't typically recommend Target Disk Mode installs unless you are sure you won't upgrade and are prepared for the possibility it might not work. Also the alternative of moving the hard drive to a supported machine has the same pitfall. It is better to get an external FireWire DVD drive that boots the Tiger installer or use the CD Media Exchange Program than attempt the former two types of installations. Thanks for the cautionary observation. I ran into no difficulty installing Tiger on my iBook via Target Disk Mode and the drive in my Pismo PowerBook, but the Pismo was originally a 500 MHz G3 (now a 550 MHz G4), and the iBook is a 700 MHz G3, so I expect that the System resources they require respectively might not be very different. I forget which machine I used to install OS X 10.3.9 on my external FireWire drive, but it happily boots and runs all three of my current laptops, including a 1.33 GHz 17" PowerBook G4. I agree that the ideal would be to run the installer DVD from a bootable external drive or get the CD pack, but, as I said, I didn't encounter any problems using Target Disk Mode. I know you're the resident Opera lover there at Low End Mac. I hope you don't mind my asking this question: Is there a setting in Opera that makes it the default browser when you open it? Here's my problem: I normally use Firefox on my [Power Mac] G4/533 with OS X 10.2.8. My wife continues to use Opera 5.0 in Classic, because that's where all her bookmarks are and it works for her. When she does this, however, it changes the default browser on my system to Opera, so that if I click on a link in an email, Opera (version 7.52) opens, not Firefox, even though I've set Firefox to be the default browser. Any idea what's going on? Any suggestions for who to contact at Opera, or perhaps an Opera forum that I could post a query on? That's very peculiar. I've never before heard of similar behavior. There is, of course, a reason, but I'm buffaloed as to what it might be. Opera 5? Yikes! More recent versions are soooooooo much better. Why not try migrating your wife to Opera 9 in OS X and importing her bookmarks? That might resolve the issue. Opera and FireFox cohabit harmoniously on my machines, although I do have Opera configured as my default browser (via the Preferences in Safari or Camino). I read your article Is OS 9 Still a Player? 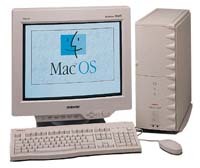 FYI, I run OS 9 on my Intel MBP 17 - It runs full screen or in a window, using SheepShaver's Intel Universal binary JIT compiler, if feels like a 500 MHz or faster Mac G4. So far I've been very happy with this for Classic on Intel. I've installed Streamline and Fontographer and other apps that won't run on OS X natively and are no longer updated. BTW, thanks for your page and all the info you provide - I'm a long time user of Macs and still own an original Mac SE with MS Word 1.0 :) I even used to have an Apple Lisa (years and years ago). I keep the Mac SE around as a conversation piece. My new MacBook Pro 17 has been great so far, with few snafus to complain about (other than Classic being absent). Thanks for your kind comments and for the report on SheepShaver and the MBP 17". I had heard of SheepShaver and have been curious as to how well it works. Being able to run Classic applications on an Intel Mac would certainly ease the transition for me when the time comes. I came across your February 2004 article, WallStreet and Pismo Processor Upgrades: Do They Make Economic Sense?, while researching CPU upgrades for my PowerBook G3 FireWire Pismo. Like you, I think the Wallstreet/Lombard/Pismo series marks a high point in Apple laptops. They're reasonably fast, easily upgradable, and didn't cost extra for black. More than anything, I think its organic, sinuous design is what's kept me faithful to my beloved Pismo; the sleek metal PowerBooks leave me cold. I'm curious to know, however, if your opinion of processor upgrade value (dubious in general, with the exception of the G3 PBs) still stands. I'm thinking of upgrading my Pismo's aging G3 processor, but the introduction of the Intel Macs is making me hesitate. My question is: How much longer do you think the PPC G4 will remain a viable, supported platform? Long enough to make an upgrade worthwhile? Or should I save my money until I can skip right over to the newer Intel MacBooks? By happy coincidence, I just wrote a column on this very topic, New MacBook, Refurb, or Upgrade the Pismo? - Unravelling the Dilemma, weighing the pros and cons, for PB Central. In a nutshell, I think there is a case to be made for PowerBook processor upgrades, and I'm considering one for my 17" PowerBook, but I suggest careful consideration of your needs and whether it wouldn't be more advantageous to put the cost toward the purchase of a new MacBook. That said, I'm still extremely happy with the 550 MHz G4 upgrade in my Pismo, which is still in daily use. Many thanks for confirming that Adam had not gone away. I guess I don't pay attention to the dates anymore. Dan emailed me, telling me Adam is a student, to which I can only relate; I'm going to be in my last year of high school, and it's not going to be easy. I've got a completely different topic I need to ask you about. I read your most recent Mac news review, and the story on the iMac DV running Tiger "amazingly fast". I need to know, since I have a Power Mac G4 AGP Graphics, if Tiger would indeed run very well on an iMac DV, since I am actually considering buying Tiger for my G4 (It has 1 GB of RAM and a 450 MHz processor, by the way), and I was going to use this story as proof that my G4 may run Tiger very well. I just want to know what you would think of that, as a second opinion would be greatly appreciated. One's satisfaction with system performance is a highly subjective matter. Personally, I was not thrilled with Tiger's performance on my 550 MHz G4 Pismo PowerBook, but have found Tiger a satisfactory performer on my 700 MHz G3 iBook. I suspect that the respective video support in those machines is probably the factor rather then clock speed or processor family. The iBook has twice as much video RAM and a better graphics processor unit. On the other hand, my daughter has been running Tiger on her 450 MHz iMac for over a year and professes to be happy with its performance. My guess is that your 450 MHz Power Mac would run Tiger successfully, provided you have enough video support muscle. (I would suggest a minimum of 32 MB of VRAM and a Radeon 7500 or better GPU). I have another question. It turns out I am going to be working almost full time for awhile at home on my laptop (either my Pismo or 12" PowerBook G4). either way, I am destroying my neck, back, and wrists by working on my lap, on my bed or a reclining chair, or at a table. It's an ergonomic nightmare! I have read many of your articles on lap desks, etc., and I am unable to sort out what is the best set up for me. So here's the question: If you were to choose one (or even two) of the best, i.e., most effective, not necessarily most expensive, 1) lap desk which would ideally work on my bed and the comfy chair, and then convert to a desktop setup (so I don't have to buy two separate items) to raise my PowerBook to eye level or wherever it's supposed to be, 2) an external keyboard and mouse, and maybe even a decent chair, which would you choose and or recommend? I am about 5'3". Unfortunately, there is no laptop stand product that really elegantly serves the dual purpose for use while reclined and on a desktop. For working in bed, on a sofa, or in an armchair, I recommend either the Laptop Laidback or the surfACE Laptop Stand. You can read a recent column of mine, Laying Down On The Job With Your 'Book, comparing their respective virtues on Mac Opinion. While either can also be pressed into service as a desktop stand, provided you have adequate desktop space, both are pretty bulky and not really ideally suited to use in that mode. There are so many good desktop stand solutions that it's difficult to pick a favorite. As long as it gets the screen up to an adequate elevation, any of a number of units will do the job. One potential issue is whether the stand will block the laptop's front-loading optical drive slot, but since your Pismo and LittleAl are both side-loaders, that's not pertinent to your choice. Keyboard preference tends to be highly subjective. My current faves are the Kensington SlimType Keyboard and the i-Rocks Mac X-Slim Backlit USB Keyboard, which share form factor and engineering. You can read my recent review, Two Laptop-Style Freestanding Keyboards, One With Backlit Keys, at PowerBook Central. For workstation chairs, I prefer an armless task chair with pneumatically adjustable height. These range from dirt cheap to moderately pricey. I paid about $60 for mine. In order to make readable websites and/or animations made with Flash using iCab, the solution is amazingly simple: It's sufficient to duplicate the Flash and Shockwave plug-ins (flashplayer.xpt, ShockwavePlugin.class, NP-PPC-Dir-Shockwave, Shockwave Flash NP-PPC) which are in the Mozilla plug-ins folder and put them into the iCab Plug-in folder with drag 'n drop. I've tested this solution with iCab 2.9.8 PPC and with iCab 3.0 Beta, and it works very well. Thank you for the very useful tip. I had the good fortune to get an ATI VR128 a long time ago (just a few years, but that's a long time in the world of computers) and originally used it on my beige G3. It was able to get good high quality video for a while, but it was not stable and usually crashed if you tried to get more than 10 minutes. I rebuilt the G3 as a music system and went back to its original graphics system. I then tried the video card in a 7250/120 that I got for a song somewhere and was amazed to find that it worked at full frame rate and size: 30 fps and 320 x 240. Video still looked good when converted to Cinepak, and it was far more stable than the G3, usually being able to record up to 2 hours at a time. I was putting all this on an 80 GB drive through another PCI card. I can't remember the name of the card right now, but ii is made by the same people who make "Tempo". It all worked together very well, and I was able to make some pretty creative video using Quick Time Pro and Avid Videoshop. I put it on Video CDs using Toast 5. I made a promotion video this way for my music. I also have an adapter that puts out NTSC for a tape. The only real problem was to try to convert a 1 hour video to Cinepak or MPEG with the 7250. It took a week. I did not do anything that big very often. Later I put the video card in a PowerPC S900, a 604 clone that runs at 225 MHz. Much faster than the 7250. I still use these old systems, because I don't have the money to go to the new stuff, and System X.
I'm glad they work so well. I don't think this could have been possible with a Windows machine from the same year. How do you like them Apples? I do. Sounds good. I also have a Umax SuperMac S900, although it has a 200 MHz 604e. It's a great, amazingly expandable machine if one is content using OS 9. Actually, my offspring put a Sonnet 500 MHz G3 processor in another S900 and got OS X 10.4 "Tiger" to run on it. The S900 recently died, and I found a used 9600, which I thought I could use in its place. Interestingly, when it arrived, it had some sound and video PCI cards in it, but no docs or drivers as far as I could tell. From the scant information I could get about the cards, it appears to be a special purpose machine set up for some kind of video application. There is a label that says "Avid system ready", and the inside has a label with a description of the cards. I have a copy of Avid Videoshop 3.02, and I wonder if that is part of the software system it needs to use all those cards. This program works OK for editing video which was input some other way on my older machines, but its recording option does not know what to do with the ATI card. The person I got the 9600 from put in a fresh install of system 8.5, and it may have wiped all the Avid software. If Videoshop 3.02 is just part of what I need, I wonder where I could get the rest, as well as any cables and external devices this may have had. It looks like it may have a card that compresses MPEG in real time while recording. This might be a better video system than what I have been using, if I can find all the parts. Sounds interesting. I haven't a clue as to where you might find the missing software, but if you do, let us know how it turns out. Sorry, minor correction. It isn't that Intel is just releasing the Itanium 2, it's that they're just releasing the dual-core Itanium 2. The Itanium 2 has been around since 2002. It really is a good chip (at 1.6 GHz, it spanks the 2.7 GHz G5 in floating-point operations), it's just that it was so ridiculously expensive to develop that Intel will never make the money back; combined with a marketing disaster. In fact, according to SPEC.org, the 1.6 GHz Itanium 2 is still the fastest single-core floating point processor out there with a score of 2712. For comparison, the brand new dual-core 3 GHz Xeon 5160 scores 3056, so with double the cores and almost double the GHz, it only scores 12% higher. IBM's dual-core Power5 at 1.9 GHz scores 3048, though. The new Xeons (previously known by the code name "Woodcrest", and likely the processor about to go into the Xserve and possibly the Power Mac replacement) absolutely dominate in integer performance, though, with the new Xeon 5160 scoring 3039, and the closest competitor being a Sun Ultra 40 at 2057 (although the Sun is single-core). The Itanium 2 is well down the list at 1590. (You have to dig through their results search engine to get it to display results in a nice way - also, sometimes IBM claims the Power5 has two cores, sometimes one, even when the results are almost identical). So if performance scales perfectly double with Itanium 2's move to dual-core, it should just barely exceed the new Xeons in integer, and dominate in floating point. Itanium 2 has even had 5 revisions already. See the Itanium 2 Wikipedia article. Thanks for the elucidation, Ed.